Movie: A Russian and a German sniper play a game of cat-and-mouse during the Battle of Stalingrad. War of the rats in crumbling Stalingrad during WWII RELEASED IN 2001 and directed by Jean-Jacques Annaud , "Enemy at the Gates" takes place in the last four months of 1942 during the pivotal Battle of Stalingrad. Russian troops are carted in by the literal trainloads as the Germans attack/bomb the city. Once the dust clears the situation settles into a more personal battle of sharpshooting wills. 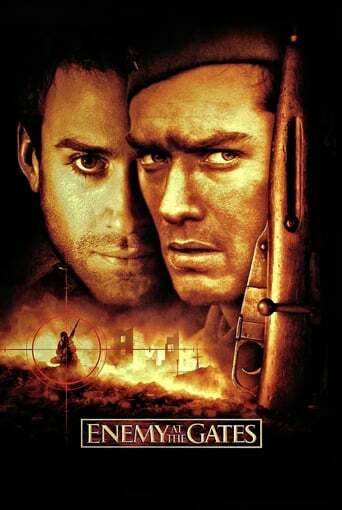 A lowly young Russian soldier named Vassili (Jude Law) distinguishes himself for his shooting skills and is promoted as a national hero to motivate the Russian cause. After numerous German officers... read the rest. Copyright © 2016 movstar.dev. All rights reserved.